The average cost for site preparation is around $2,700, but the price ranges from as little as $350 to upwards of $8,000. 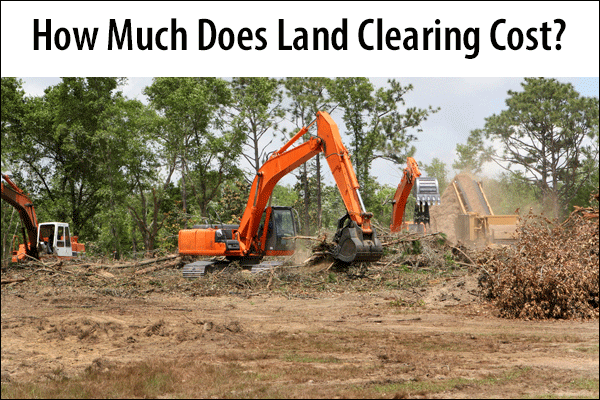 It depends on the amount of clearing required and size of the land. Expect to pay between $1.25 and $2 per square foot of land. What Does Site Preparation Require? Site prep typically begins with a land survey to identify boundaries and easements; you don't want to start digging over underground utilities. The survey also allows you to assess the site against the project plan to determine how much clearing and grading it requires. A land survey costs around $500 on average, depending on the size of the site, landscape, and more. The next step in site preparation is usually clearing vegetation and rocks from the project area. The more obstacles there are, the longer and more costly the clearance stage. After clearing obstacles, grading usually follows. Specific details, such as drainage, depend on the project and size of the land. Common steps include staking the construction area, connecting the site to utilities, digging out a foundation, and demolishing any existing structures. You may also need to apply for permits, which may add additional time and financial costs. Most contractors charge by either square footage or acreage. The land type helps determine the rate. Land with a low slope and light vegetation averages between $3 and $6 per square foot or $200 and $2,000 per acre. Land with uneven terrain or high slope and heavy vegetation costs around $15 per square foot or between $3,000 and $6,000 per acre. Removing a single tree costs around $650 on average, but only around $100 to remove fallen trees. Tree removal by the acre starts at around $1,000 for a lightly-wooded site and $4,500 on average for a heavily wooded area. Brush removal costs around $100 per acre on average. You may need to hire a civil engineer to perform soil testing. The hourly rate for this averages between $35 and $75, but it's often better to budget it as a percentage of the build. The average is between 1 and 2.5 percent. Contractors typically include the cost of equipment in their price. But if you clear the land yourself, equipment rental fees vary depending on the type of equipment and length of time you need it. For example, renting an excavator costs around $450 per day or $1,500 per week. The average permit fees are around $150. 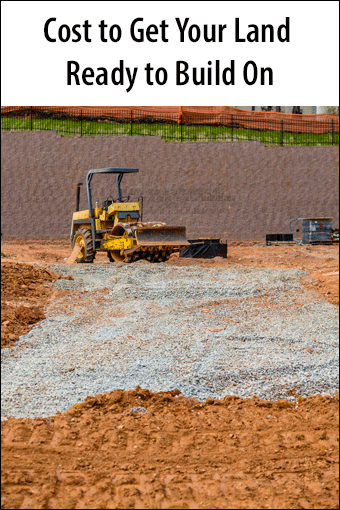 Site preparation costs can add up quickly. The following ideas can help reduce that expense. Request multiple bids; competition usually leads to better pricing. Look for land that's easier to clear. That means an even terrain and minimum vegetation. If time permits, schedule your project during the off-peak season. This varies according to where you live. For example, if you live in a cold area, off-peak is typically during fall and winter. For those in hot climates, off-peak may be the height of summer. If your property has a lot of trees, you may be able to sell them to either a lumberyard or as firewood. You may even find a firewood company that's willing to remove the trees for free. Soil removed during grading may have value as fill dirt or to a local garden center. Some states offer tax deductions for land clearance. Look at local sustainability credits, too. And, of course, if it qualifies as a business expense, you should be able to claim the cost on your taxes. Site preparation is a crucial part of the construction process, so it’s important to choose the right contractor. You could run into serious problems down the road if the land has not been properly graded and prepared. Ask people you trust for referrals. Who did they use for site preparation, and were they satisfied with the work? Was the job completed on time and under budget? You can ask friends for referrals, or you can talk to trusted builders or real estate professionals. Do some background research on any company you’re considering. Check the company’s track record with consumer organizations like the Better Business Bureau. Ask for references - and actually check them. Ask for proof that the company is licensed, bonded and insured. A company that is not licensed is operating illegally, so that’s a major red flag. A bond protects you from financial loss if the contractor goes belly up or does not finish the project. And insurance guarantees that you are not liable for any accidents that occur on the property during site preparation. Do You Need a Land Preparation Pro Near You?